Miwon Specialty Chemical Co. Ltd.
We studied and will present the effect of various monomers and oligomers with high refractive index on optical film prism sheets. Recent technological trends in thin film transistor-liquid crystal displays (TFT-LCDs) include thinning, lightening, decreasing power consumption and decreasing costs. In particular, low power-consuming products are in high demand worldwide because of increased energy-saving awareness. The electrical power consumption of a TFT-LCD is determined primarily by the back light unit (BLU). To ensure brightness uniformity and high luminance, the BLU is composed of several kinds of optical materials: a light source, reflective sheet, light guide plate (LGP), diffuser sheet, prism sheet and a mold frame, as shown schematically in Figure 1. Therefore, high refractive materials play an important role in determining LCD efficiency. Sulfur- and bromine-containing polymers have been developed for advanced integrated optical applications. However, due to increasing environmental issues, halogenated materials are being replaced with halogen-free high refractive materials. Until recently, high refractive index materials that contain bromine have been used mainly as component resins in the prism sheet. However, it is no longer allowed due to regulatory restrictions in the use of hazardous substances. To achieve high refractive index materials while following these environmental policies and restrictions, monomers that contain aromatic groups were developed. To improve the optical efficiency of LCDs, o-Phenylphenol ethyl acrylate and bisphenol fluorene diacrylate are currently being used, though there is great interest in further enhancing the refractive index and mechanical properties of the refractive materials used in the BLU of LCDs. The flat panel display (FPD) industry has been continuously growing since the 2000s. Such growth could be derived from increasing usage of FPDs instead of cathode ray tube (CRT) displays, which are older display devices. It should be noted that FPD technology allowed the creation of new applications and markets (such as thin TVs, smartphones and tablets) and is not limited to replacement of CRT as existing technology. Production of FPDs exceeded the demand, which resulted in lower prices in the market. Over the next few years, the growth rate of the flat panel display industry is expected to be maintained (Table 1). The growth rate of the self-light-emitting organic light-emitting diode (OLED) displays is increasing. 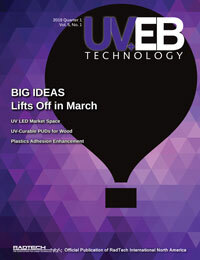 OLED technology is attracting attention as the next display after LCDs. However, LCDs are expected to occupy the largest share of the FPD industry for a few years. Quantum dot displays that are in the spotlight as the next-generation display technology also require BLUs. Therefore, the importance of optical film also will continue. Looking at industry trends in recent years, it is necessary to pay attention to automotive displays. Driven by continued innovation in vehicle connectivity and safety-related technologies, global revenue from automotive display systems is projected to grow at a compound annual growth rate (CAGR) of more than 11 percent to $18.6 billion by the end of 2021 (Figure 2). Automotive displays are divided into head-up display, center information display (center stack display), instrument cluster, room mirror display and rear seat entertainment. Among these, the display segment that most actively utilizes LCD is the instrument cluster (Figure 3). In 2018, LCD panel shipments for automotive instrument clusters are expected to reach 50 million units. The market is expected to expand from $4 billion in 2015 to $9 billion by 2021. Global shipments for instrument cluster displays are shifting from 3-inch and 4-inch units to units greater than 5 inches, and center stack displays are shifting to 7 inches and larger. Center stack displays between 8 and 10 inches already are common among high-end vehicles and luxury brands. The highest rate of growth is reserved for head-up displays. They are set to increase by 65 percent, surpassing 6 million units annually, by 2021. Evaluation criteria for automotive displays are getting higher. Basically, the unit is exposed to severe vibration, dust and temperature changes in real driving conditions, so it must have a higher safety requirement than other displays. These requirements need to be taken into account in developing optical films. The overall production volume of optical films is expected to be maintained, but market revenue for the optical films in BLU has decreased since 2014. In addition to the price decline of the optical film, the number of optical films in the BLU has been reduced to produce a slimmer display unit. TFT-LCD panels are built from several components, including glass substrates, liquid crystal, plastic frame and optical films. Optical films play an important role in the TFT-LCD module in aiding in the control, diffusion and brightness enhancement of light and in contrast ratios. Figure 4 illustrates the marketing information for BLU optical films. We will be focusing on the prism sheet, which needs high refractive index (RI). Prism film is a micro-replicated prism structure film assembled in the LCD backlight module to enhance luminance. BEF (brightness enhancement film) also is called lens film or prism sheet. BEF is 3Ms marketing name for prism sheets. The base film of BEF is polyester (PET) or polycarbonate (PC). This product relies on internal refraction and subsequent re-reflection to direct off-angle light to the front of the display. A single sheet of prism film can redirect off-angle light toward the viewer, coming from one direction only (horizontal or vertical as seen by the display viewer), depending on the alignment of the prisms. The off-angle light from the other direction still comes through an off-angle. This can be addressed by stacking two prism films on top of one other: one for the horizontal off-axis light and one for the vertical, as shown in Figure 5. Recently, an increasing demand exists for slimmer displays. The use of a multifunctional prism (composite sheet) is expected to further increase. Prism films are generally produced by soft mold or hard mold process (Figure 6). Due to the cost advantage in manufacturing, stable yield and easy implementation of complex/large patterns, the soft mold process is used by many optical film manufacturers. Generally, the prism film is produced by primary curing when forming the pattern through the mold. Then it undergoes secondary curing after release from the mold. The final step is to attach the protective film. However, the detailed manufacturing processes and conditions vary, depending on film manufacturers facilities and production lines. The refractive index depends on the polarizability of the material; therefore, it is desirable to maximize the dipole moment per unit volume induced by the electromagnetic field. Substances containing more polarizable groups (e.g., bromine, iodine, sulfur and phosphorus atoms or aromatic rings) or those that have high polarizability over a large atomic area will normally have higher refractive indexes than substances containing less polarizable groups or strongly electronegative substituents, such as fluorine, oxygen or alkyl groups. i) Aromatic group Bulky conjugated or aromatic substituents have a high refractive index. Therefore, a molecule that contains multiple aromatic rings may be expected to have an even higher refractive index. Bisphenol-A epoxy diacrylate has a refractive index of nD25 = 1.557. While this product has a relatively high refractive index, its viscosity is relatively high: 4,500 cPs @ 60°C. It will be almost impossible to apply such a product by standard coating techniques. For this reason, a low-viscosity monomer with a single-ring structure was developed. ii) Halogen Halogenation is a well-known approach to high-refractive index materials. A typical halogenated molecule with a very high refractive index (nD20) of 1.70 is pentabromophenyl methacrylate. However, this molecule has a poor compatibility/solubility with other molecules because of its very high halogen content. A brominated version of Bisphenol-A epoxy diacrylate has been developed. It has a relatively high refractive index, nD25 = 1.588, along with good compatibility with many other UV resins. Globally, there are fast-growing demands for halogen-free materials with high refractive index because of increasing environmental concerns. Achieving equivalent RI without the use of halogenated materials is a major challenge (Table 2 and Table 3). iii) Hetero or sulfur Many conventional sulfur-containing molecules, particularly sulfur-containing aromatic molecules, are characterized by high optical transparency, high dielectric constant, good adhesion to substrates and high refractive index. One well-known example is bis(4-methacryloylthiophenyl) sulfide, or 4,4′-thiodibenzenedithiol dimethacrylate, which has a very high refractive index (nD20) of 1.66. However, it is in a solid state at room temperature and, more importantly, it has a very limited solubility/compatibility with other UV resins. Proprietary technologies have been developed to enable the synthesis of a series of heteroatom-containing aromatic urethane acrylate oligomers. These oligomers have a high refractive index, nD25=1.58 (liquid), and excellent optical transparency. Additionally, these oligomers are compatible with many commercial UV resins, thus making them easily formulated. A high RI formulation for the prism sheet also requires low viscosity value for coating. Therefore, we recognize dilution power as being important for high RI formulation. From Figure 7, we can find viscosity value when blending each monomer with O-3 at 30 percent, where O-3 corresponds to di-functional urethane acrylate. The highest quality of dilution power is observed with monomer BA. However, in case of BA, it tends to reduce the RI in the test formulation. In consideration, the most important point is to raise the refractive index. Relating to this point, test results reveal that using BPMA or OPPEA will raise the RI formulation. Commercially, the preferred monomer is OPPEA, when taking dilution power and refractive index into account. Recently, demand is increasing for slimmer displays and lower costs. To reach these demands, increased efforts are being made to reduce the number of optical films and to enhance brightness. Those efforts include a trial to remove the protective film that covers the outside of an optical film, using the film as it is. To avoid damage to the prism sheets lens detail, a product with enhanced hardness and scratch resistance must be developed. It is extremely difficult to increase the refractive index while maintaining scratch resistance. In the course of this development work, products were obtained with enhanced elasticity by means of EO addition into fluorine-containing molecules with refractive index at a high level. The products, in which treatment of EO addition is given to fluorene structure, are M-4, M-5, M-6 and M-7 (Table 4). One more important factor is hardness of optical film coating. We performed pencil hardness and pendulum hardness evaluation by coating test formulations on PET film typically used for prism sheet. EO addition type products are seen to be lower in hardness. However, this doesnt mean the scratch property is lacking, as the EO functionality plays a role to keep the prism sheets details intact, courtesy of elasticity improvement. When comparing M-7 with M-4, the former contains more EO than the latter, resulting in an improvement in flexibility (Table 5). It is found that most high refractive index materials tend to yellow due to the inclusion of a large number of aromatic rings (Figure 8). To minimize yellowing, trials were done (Figure 9). In the cases where halogen or sulfur structures are found, yellowing is significantly increased. To compound the problem, sulfur is accompanied with an odor issue, so these structures tend to not be favored. The adhesion property is regarded as the most important one for coating application. All products show excellent or good adhesion on PET (Table 6). The adhesion properties of EO addition types also are excellent, even when the molecular weight is relatively high. Demand is quickly growing for new materials that have higher RI, higher performance and, especially, are halogen-free because of increasing environmental concerns. Achieving equivalent RI without the use of halogenated materials is a big challenge. Based on a broad understanding of the refractive index, new technologies have now been developed to address this challenge, including heteroatom-containing materials. For more information, visit www.miramer.com.